Nazca, Ica, and Paracas, the desert places of Peru. 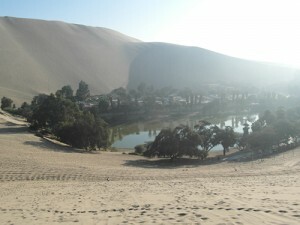 Not to forget, the Huacachina oasis located next to Ica. Enough reasons to visit this interesting region of Peru. The mysterious Nazca Lines! Almost everybody feels attracted to them. Not without a reason. 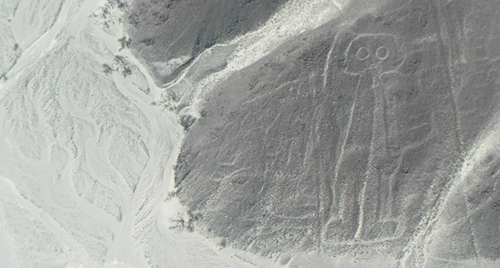 These lines located at the Pampas, 400 kilometers of Lima, where created possibly around 500 B.C. The perfection and the remote area raise questions, of into what extend these civilizations where developed. 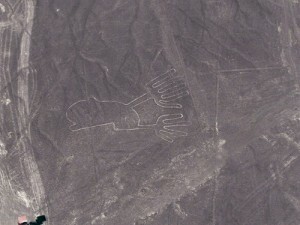 How did they create the Nazca lines? Nobody knows. The experience! Arriving at the airport of Nazca you are greeted by the ground personal, you weight is measured and a documentary is played of the old Nazca civilization. Getting nervous, you are about to step into a small propeller driven airplane, luckily flown by two pilots. Ready for takeoff, and there you go! As the pilot flies closely to the ground to give you the best view of the lines you are able to make pictures. After half an hour of a stunning flight, the airplane lands safely back on the ground. What is next, in this desert landscape? Well, one of the most popular sports in the Ica desert is Sand boarding. It feels a bit like snowboarding but then on the fine sand of the Ica dunes. However, first there is the bumpy ride on the so called sand buggy. Still dark and with the bright lights of the buggy shining on the misty dunes, it is an exciting ride. The driver makes easily vertical turns on the dunes. Yes, those sand buggies are capable of doing amazing tricks! One advice: put the seat belts on! Finally, installed to conquer your first dune, against the pink /orange sky colored by the sunrise, adrenaline is pumping trough your blood. Don’t worry it is all worth it! Nothing compares to the sensation of gaining speed on the hill as you slide down, while the guide is making pictures of your thrilling moves! After several dune slides, it is time to sit behind the wheel of the sand buggy! Really recommendable, it is like you are the god of the desert able to climb and to go down on very steep hills! The tour ends, with a stunning view of Huacachina Oasis. 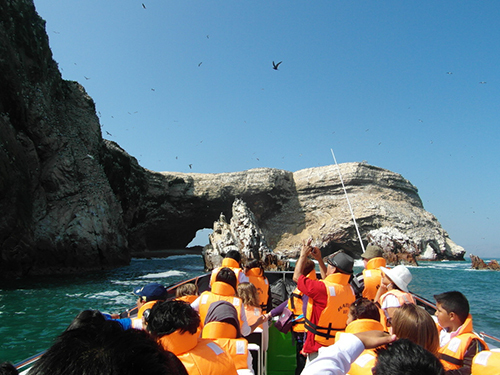 Moving on, it is easy to go from Huacachina Oasis to Paracas, the land of whales, sea lions, and a huge number of birds. These species you can find at Ballestas Iland, also called the “Peruvian Galapagos”. Well, that is promising! Jumping on the boat, which goes 60 km per hour; you smell the typical sea air. Once the boat sails of, birds are flying in formation next to and the sun is shining bright on your head. The site of the Ballestas Ilands fulfills you with admiration, the wild life the rock formations and the turquoise color of the water. Not only the Ballestas Islands is making his promises true, the whole Ica region does! Another lovely weekend in diverse Peru!